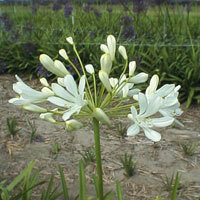 Agapanthus, also know as African Lily, originates in South Africa and belongs to the Liliacea family. 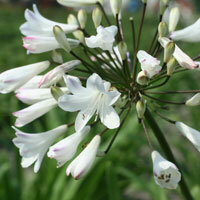 The Agapanthus with it’s leaf keeping habit probably appeared in Europe in the seventeenth century. 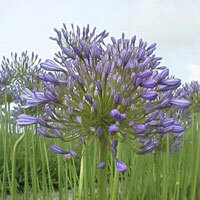 It took a long time before people found out that there were also Agapanthus varieties which loose their foliage. 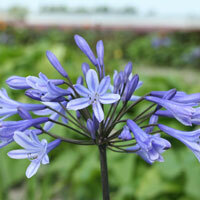 Agapanthus is being grown in the Netherlands for pots, small bags and cut flowers. Because strong stems are preferable for cut flowers much of the hybridizing was focussed on length. An Agapanthus for a pot has more ornamental value when it is relatively short, so that there is a better balance between pot and plant. Over the course of years there have been so many hybridizing efforts that there are currently more than 600 different varieties, in white and blue to almost black.